REVERENCEMEDIA.COM » Archive » What would you do for shoes? This story, is totally off the wall, but is completely true, and it just happened a a few minutes ago. At 10:14 this evening I received a phone call from a good friend of mine. He had a very unusual request to ask of me. 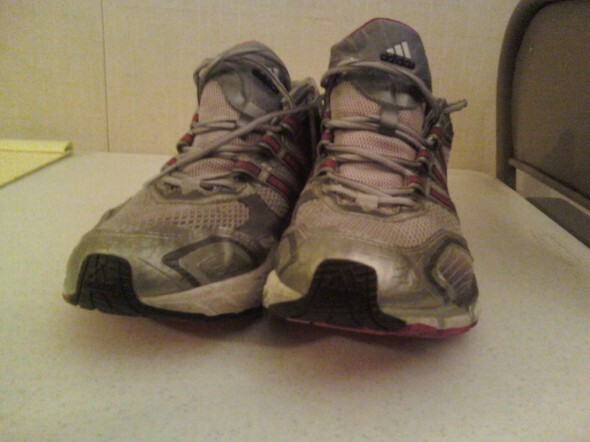 He asked me to drive to his house, a little over a mile away, and see if I could find his running shoes which he hoped were sitting on the curb in front of his house. After asking me to that he asked for one more favor, he asked that if I didn’t see them there to drive through his neighborhood on the route he took to leave and see if I could find them there somewhere. He set them on top of his jeep and drove off to go camping with his family about 2 hours prior to calling me and was now up near Big Bear. Let me step back for a moment and explain why these shoes would be worth the trouble. My friend has size 14 feet and has an incredibly difficult time finding shoes that fit him. So he really didn’t want to to go through the trouble of looking and then having to buy a new pair of shoes. So i head out and I drive to his house, no shoes on the curb, then I proceeded to take his exit route and sure enough at the first turn I see a shoe in the middle of the street. I get out look around for a second pair but couldn’t find it so I got back in my car and began driving again looking for the elusive second pair. I drive and I drive and I look and I look but to no avail. After about 20 minutes or so of circling the same streets, extremely slowly I might add, I decide to call it quits. That and I was beginning to get nervous a neighbor somewhere might be getting suspicious of this car slowly going through the neighborhood over and over again. This is Fountain Valley mind you, jay walking is a big thing for them. So regardless I text my buddy that I found one but didn’t think the second was likely and I left to go get gas while I was out instead of wait till tomorrow. He text me back thanks and jokingly mentioned that he took the 22 and passed my house on the way so keep my eyes out. Well sure enough on my way home, right there on Euclid maybe 30 to 40 feet before I would turn into my mobile home park I was pretty sure I saw a shoe. I stopped, threw on the hazards, crawled through the passenger seat and door, didn’t feeling like risking it on the side traffic was coming, and got the shoe. All in all, a successful although unexpected and slightly awkward evening. And when I think about what I did for a pair of shoes, I realize I really did not do much at all. There are people much less fortunate than me in other countries that I am sure would quite literally kill for shoes or food. So I also take this as a reminder to be thankful for those basic things I do have and would consider necessities. A vast majority of this world would consider my necessities to be great luxury. 07/23/2010 | Filed under Miscellaneous. One Response to What would you do for shoes?